DISCLOSURE: Some of the links in this post contain affiliate links. Know that I only share and promote products I personally use and stand behind. To learn more about my affiliates, please review my disclosure policy here. With the holidays fast approaching, I thought I’d help out readers with some suggestions for holiday shopping. Unlike A LOT of other blog posts on this topic, this list includes items we personally USE and LOVE, not something strictly promoted by a company during this season. Hope they line up with someone on your shopping list!
. 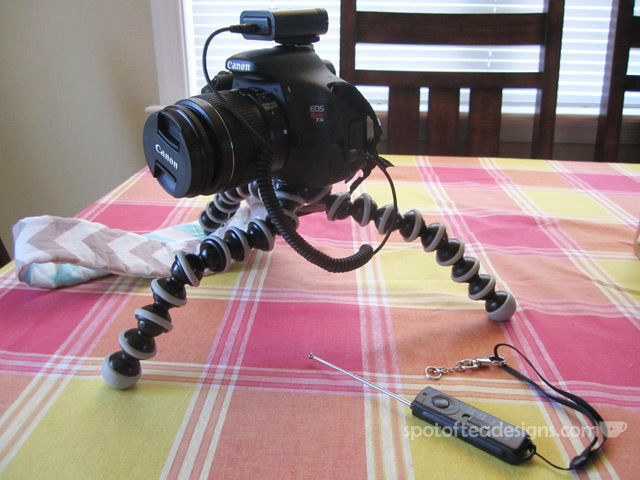 This tripod is not tall, but great to capture your own step out shots of projects using your DSLR. If I need more height, I flex around the feet onto the top of a chair. I’ve used this tripod to capture fun crafting projects with Brielle, including our Valentine’s Card, Mother’s Day Cards and Father’s Day Picture Frame and highly recommend it for the blogger, mom or beginner photographer! Vello FreeWave Wireless Remote Shutter Release for Canon w/3-Pin Connection. I use this in conjunction with the above tripod (see attached in above photo). It allows me to get the shots but also continue to help Brielle with her crafting project. I can easily click the button with a live shutter release or wait for the delayed timer to kick in. These are my go to scissors in my crafting tool carousel! They have a non-stick tip so you can easily cut stickers or other tacky surfaces without getting them stuck to the scissors. They have a sharp precision tip which allows you to easily cut around any shapes when doing fancy cuts. If not online, try looking for them at your local craft store. They seem to be moving away from offering this product so grab them while you can! I love these tweezers. First, just like the Honeybee scissors, they have a non-stick tip so they don’t stick to anything which is great for cutting up stickers or working with hot glue. Second, they aren’t like your beauty tweezers. They actually hold the item when you aren’t squeezing the tool together and release it when you do squeeze. 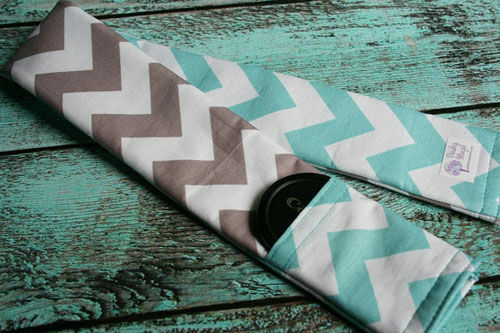 This makes it easy to pick up and work with small embellishments when crafting up a storm! You’ve seen me use this to create the paper rosettes for my Cards Garland for my wedding and the mini envelopes as this tool helps create nice creases for crisp folds. You’ll no longer need to go searching for your bone folder as it conveniently stores in the flip top lid in this crafty case! Pampered Chef Nylon Knife. This knife is great for sticky sweets! 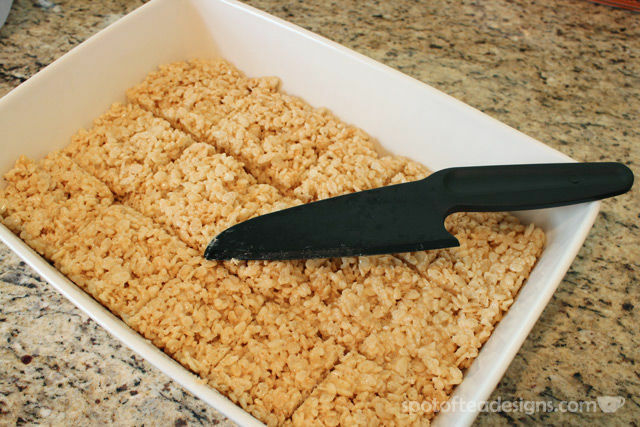 I use it when cutting brownies, blondies or Rice Krispies Treats and love that it will smoothly cut up my snacks without sticking to the knife surface! It would make a great stocking stuffer due to it’s small size. and use this machine to cut, seal and vacuum bags in whatever size you need! I had another cupcake carrier before but the cupcakes never sat in it right! This container is great as you can put 24 cupcakes in it or a small flat sheet cake!
. We have an awesome backyard with a large deck we spend afternoons and nights outside for fun summer parties and the occasional outside dinner. 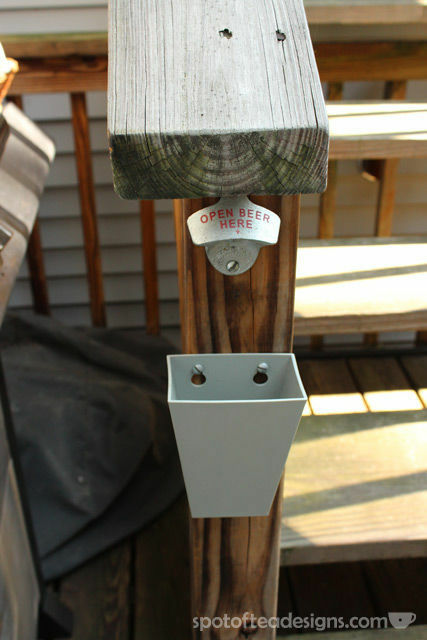 With a dad who works for a brewery, you can bet we enjoy some bottled beverages in this space so this wall mounted bottle opener and catcher are conveniently attached for outdoor use. Note: You can just buy the bottle opener but the catcher is key to make sure you don’t have random bottle caps floating around! It can be easily detached to empty it when it’s full. Powerwasher. I love me some before and after photos but I never get to catch them for all our power washing tasks. Come spring, anytime in summer or early fall, you can find Derek outside finding SOMETHING to power wash. Sidewalks, our shed, yard equipment – Derek loves to see the transformation of some powerful water spray turning a moldy, dingy mess into a sparkling clean surface! Photo Gifts. 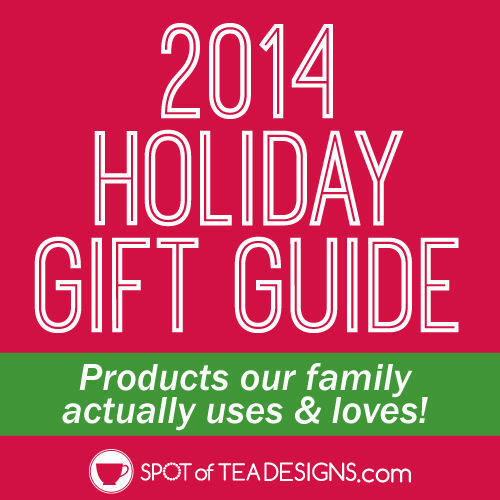 Shutterfly makes great photo home décor items and gifts for those sentimental souls! You’ve also seen me use photo books they have to create my own themes, such as my Pregnancy Journal, Family Dictionary, Like Father, Like Son book and Brielle’s birthday party guestbook, but I’ve also used the books with the themes as is to document 2013 as a year in review, 2012 wedding and several vacations. 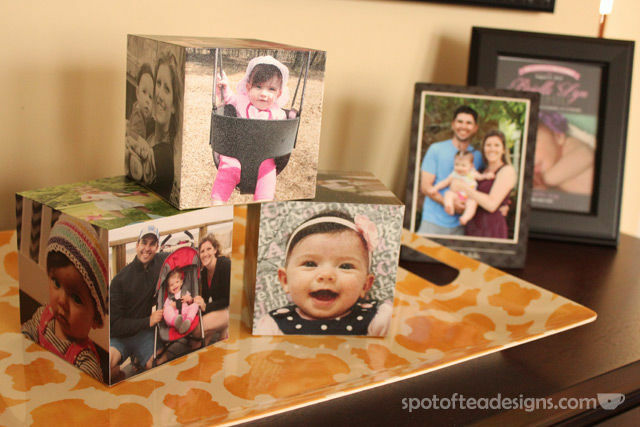 I also happen to love the photo cubes I ordered and displayed on our Family Gallery Wall in our living room! Vera Bradley Large Duffel Bag. Seriously, you can’t go wrong with anything Vera Bradley but this particular bag size is one of my favorites which I used for all our overnight trips for years. I even got a new one for Mother’s Day this year, which will allow me to pack all Brielle’s items when we’re away from home! If you have a little one at home, check out my post for the top 10 favorite baby items for a newborn to four months of age. And if they’re a little older, check out part II with my top 10 favorite baby items for five months to a year! 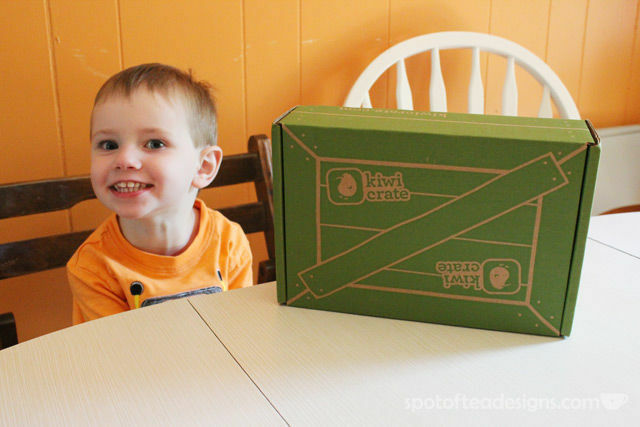 Kiwi Crate Activity Kits Monthly Subscription Give a child ages 3-8 the gift of creativity with a Kiwi Crate! Each month a box arrives with all the materials to create several educational and creative activities surrounding one theme. These are great for rainy days, snowy winters or just to occupy a creative child. My nephew Blake (age 3) completed the activities in the kit we reviewed back in May and my sister loved that all the pieces needed were included right in the box! 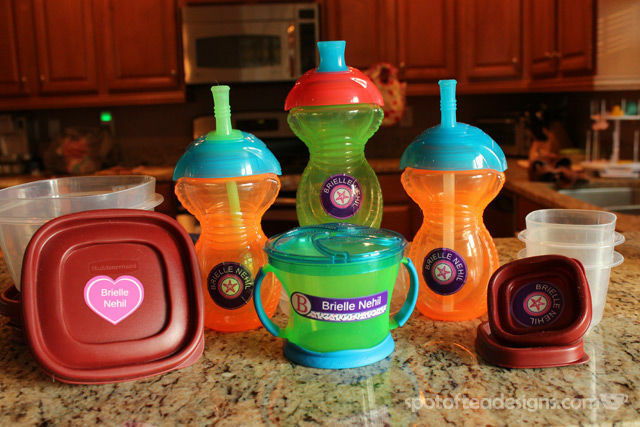 NameBubbles.com Personalized Labels – Once Brielle started daycare we needed to label her sippy cups and Tupperware items to keep it separate from the other kids. Per recommendation from my sister-in-law, we ordered a set from NameBubbles.com and have been completely satisfied with our order! The stickers are not only bright and cute, but are waterproof and dishwasher safe. I added them in September and we haven’t had any problems with any of the ones we applied. Check out my great gift guide ideas for him, her and toddlers around age 2 in this follow up post! Spot of Tea Designs readers also know that besides the items seen here, I’m also a big supporter of those who make handmade items, commonly featuring Etsy shops. 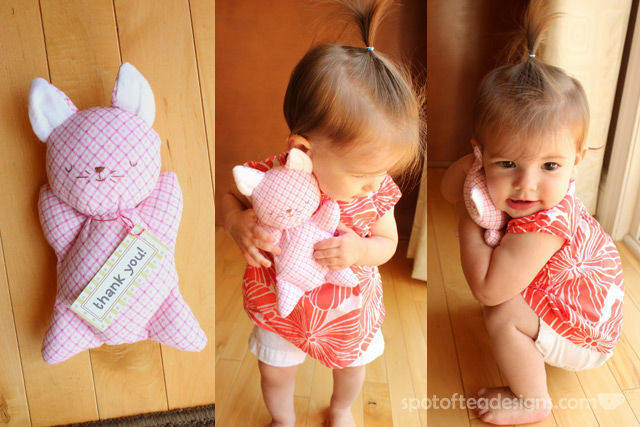 Kate, of The Woven Soul, gifted Brielle the adorable handmade kitty plush which I featured on a Handmade with Love post. She is also generously giving away one of her adorable plush animals (choice of cat, dog or bear) to one lucky Spot of Tea Designs United States reader! Enter through this Rafflecopter Widget below (or mobile users enter here) by November 13th for your chance to win! Great post! I need to get the shutter release! I use my Food Saver to seal cello or poly bags in which I have individually bagged my decorated sugar cookies. Looks ver professional! I also love the EK products! Enjoy this busy time of the year! 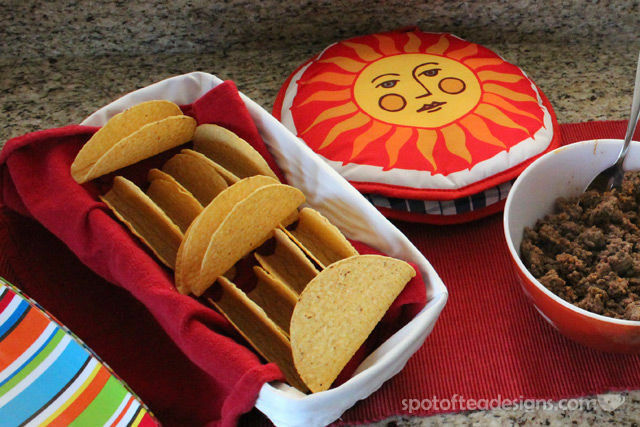 That’s a good idea for the sugar cookie bags! Makes them the perfect size for odd shapes! My favorite item in the Woven Soul store on Etsy is the Koala Kuties! I’d like to get the boy koala for my boy who’ll be born early Feb of this up coming year.